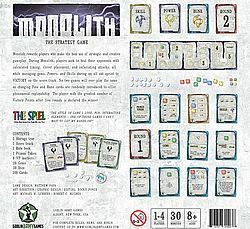 Monolith is a fast-paced, confrontational, and exciting worker placement game that will reward players who make use of thoughtful and creative game play strategies. No two games will play the same as changing Fate and Rune cards are introduced to offer phenomenal replayability. Players will be executing exciting combinations and managing valuable resources, all while cautiously engaging other players.